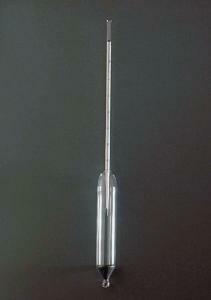 This specific gravity hydrometer ensures inherent stability and is easy to read. It has graduations of 0.0002 S. Gr. of NaCl Sol. Range: 1.000–1.070. Calibration temperature: 60°F. Size: 9 1/2"L.